The Writers’ Guild of Great Britain (WGGB) presented its annual awards for the encouragement of new writing at the Royal Court Theatre, London, on Friday 2 February 2018. 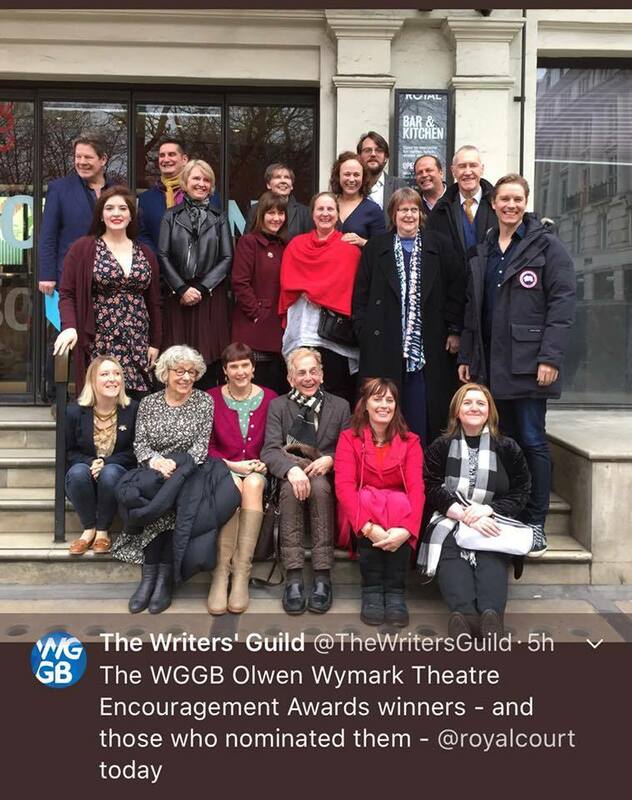 The Olwen Wymark Awards, the brainchild of playwright Mark Ravenhill, were set up to give WGGB members the opportunity to publicly thank those who had given them a positive experience in new writing over the previous year. They are named in honour of playwright Olwen Wymark, passionate supporter of WGGB and former Chair of the WGGB Theatre Committee, who died in 2013. Angela Street – Writer, Mentor, Workshop Leader, Script Reader, Dramaturg. Accredited Writing Coach (Arvon, RD1st, NAWE) Nominated by WGGB member Pippa Roberts for her support of women in theatre and inspiring Pippa during an Emerging Writers course. Pippa Roberts said: “Angie inspired me because she felt like a real role model, somebody who has struggled with the sort of difficulties I have and who has been successful. “She has a passion for theatre and writing, and she taught her workshops with the help of many different texts, so we encountered the things we might not encounter otherwise – many of us did not have the kind of income that would allow us to travel to see a lot of plays. Sue Andrews – Executive Director, Northern Broadsides theatre company. Nominated by WGGB member Deborah McAndrew for her support since Deborah’s first production for the company in 2004. Ghislaine Kenyon – freelance trainer, curator and author in the area of visual arts and education. Nominated by WGGB member Diane Samuels, for her support with her play Waltz With Me. Nicola McCartney – playwright. Nominated by WGGB member Mary Jane Wells for mentoring her for her first play, Heroine: A Female Soldier’s Story. Jon McKenna – actor. Nominated by WGGB member Anthony Mariani, for his support as a mentor for Anthony’s play The Rooster Rebellion (set on the eve of the Brexit vote), in which Jon had the lead role. Deirdre McLaughlin – director, dramaturg and actor trainer. Nominated by WGGB member Poppy Corbett for giving her the opportunity to elevate her career to the next level. Emma Manton and Matthew Woodyatt Nominated by WGGB member Jenifer Toksvig, for their support of her writing over many years and recently for her work to support refugee charity UNHCR. John Retallack – director Nominated by WGGB member Zena Forster for his continued mentorship, and support in developing her first original stage play The Fourth Dog. the salon:collective and its Artistic Director Dominic Kelly Nominated by WGGB member Mike Elliston for championing him following a long career break from playwriting. For those who don’t already know, The Writers’ Guild of Great Britain is a trade union representing writers for TV, film, theatre, radio, books, poetry, animation, comedy and videogames. It negotiates national agreements on pay and conditions with key industry bodies, including BBC, ITV and Pact; the Royal Court, National Theatre and Royal Shakespeare Company. It campaigns and lobbies on behalf of writers and offers a range of benefits to its members, including free contract vetting, support and advice; events and discounts; free training; a weekly ebulletin; a pension scheme and welfare fund. This entry was posted in Courses, Salisbury Arts Centre, Wiltshire Creative, writing coach and tagged Playwriting, Playwriting Courses, Salisbury Arts Centre, Scriptwriting, WGGB, Writers' Guild. Bookmark the permalink. Thanks Gina. How’s your writing going? ‘Worth getting up early for on a Saturday morning.’ Elanora Ferry, Bristol.